Today it was my very good friend Adam's last day at work (sob! boo! etc), so as a wee leaving present I baked him a cake. The man likes cake. 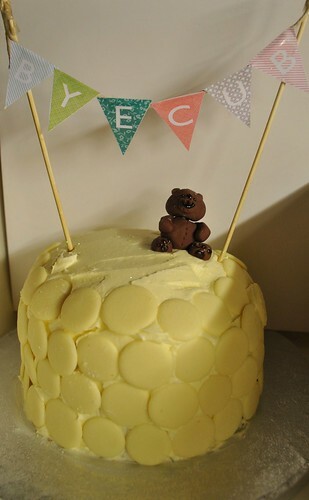 He gets nicknamed Cub, so I made a very manly vanilla sponge with a fondant bear and a mini bunting banner. I used this recipe (as it is lovely and easy), iced it with buttercream and then lined the sides with giant milkybar buttons. Mmm. 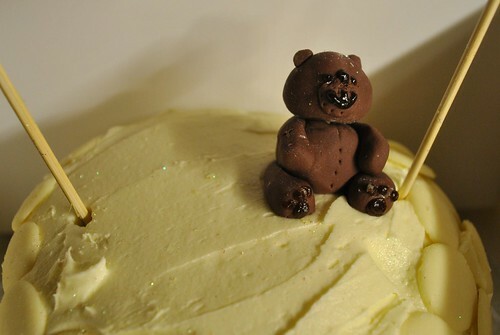 I made the bear by mixing green and red fondant (bought from sainsburys), and piping his wee face and paws with chocolate. 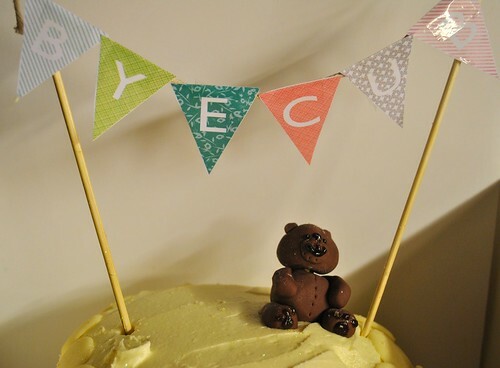 There is a skewer running through the bear to keep his head on (and luckily I remembered to warn everyone before someone tried to eat it one go!). 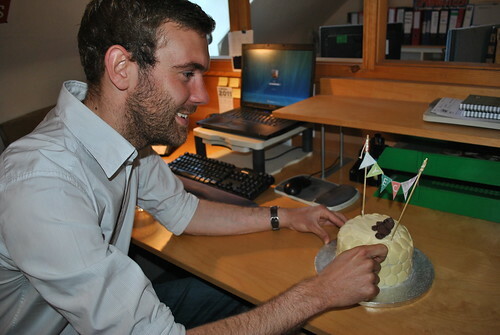 The bunting was really simple to do, but finished off the cake perfectly. 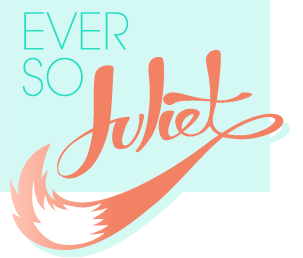 I started by downloading letters from this lovely blog, playing about with the colours in print until they looked good together, and changing the size until I was happy that they wouldn't overwhelm the cake. I used bbq skewers and string to hold it all up. Easy! It is SUCH an easy cake to do as you don't have to worry about making the buttercream neat - the giant buttons cover everything up nicely. & most importantly, it went down well! He's deaaaaaad. (He's not dead). Can't believe almost all of the old team is gone.